His cousin Leon Cagnolatti worked for him as manager of the pool hall. On his Social Security application, he lists A. J. Fabacher as his employer, but Beansie owned the business. Fabacher was the manager of the Pelican Club, one of Beansie's many real estate holdings in New Orleans -- and headquarters for many of his other interests in New Orleans, according to Lloyd Bennett. The 1940 edition of Polk's City Directory identifies Edwin Fauria and Henry E. Braden as owners (pg 144, image 64). Unmarried as of 1918, per draft registration card. "My mother and my father [Lillian Fauria and Leonard Faustina] both used to work for Beansie in New Orleans. (They cryptically called it "the syndicate"; "making book" and things like that.) Some of the businesses I'm aware of that Beansie owned or controlled were the lottery in certain wards, plus night clubs with betting on "Race Fights", and 20+ taxi cabs with Creole drivers who could pick up fares in any part of town. Those are the only operations I'm certain about, there were probably others. "My grandfather [Virgil Michel Fauria] ... also worked for Beansie. My grandfather took care of investments they made in 2nd mortgages on homes owned by New Orleans folks who couldn't get mortgages from banks. My mother still has one of the books with the names and addreses of the people who stopped in to make their monthly payments. "They also made loans to people who owned businesses. For example, Fred Fauria [Frederick Cecil Fauria (1904-1956)], a relative, borrowed money to start a bakery. He paid it back. An article on jazz in New Orleans. [S18] US-Louisiana-Orleans Parish-New Orleans Birth Records Index 1790-1899, (Ancestry.com Provo, UT, USA: The Generations Network, Inc., 2002. Original data: State of Louisiana, Secretary of State, Division of Archives, Records Management, and History. Vital Records Indices. Baton Rouge, LA. ), Vol 99, Page 968 (Reliability: 1). [S31] Social Security Death Index (ancestry.com), (Provo, UT, USA. Ancestry.com. Original data: Social Security Administration. Social Security Death Index, Master File. Social Security Administration. ), Fauria, Edwin  (Reliability: 1). [S278] Genie: Cagnolatti, Yvonne Tate Burrell, Yvonne Tate Burrell Cagnolatti (Reliability: 2). [S264] Social Security Application (original), Social Security Administration, Fauria, Joseph Edwin, SS no. 437-07-0401, 24 Feb 1937, Application for Account Number (Form SS-5), Social Security Administration, Baltimore, Maryland. (Reliability: 4). [S393] Murray, Madelyn (Faustina), Murray, Madelyn, 28 Aug 2010>, "Re: Proposed change: Edwin Joseph "Beansie" FAURIA (I1436)," (Reliability: 3). [S12] Bennett, Lloyd Walter Jr (Reliability: 2). 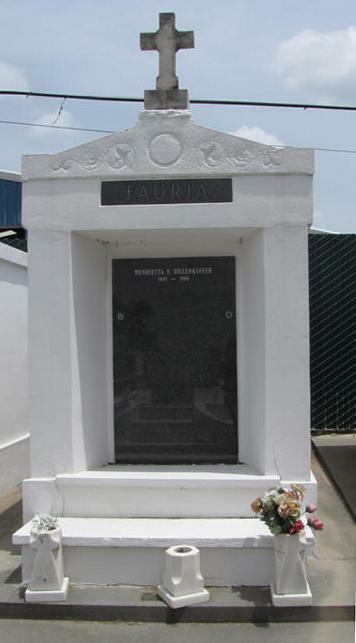 [S334] US-Louisiana-Orleans Parish-New Orleans-St. Louis Cemetery #3 Fauria Tomb ownership records, Saint Louis #3, Fauria, Edwin J. Burial 31 Mar 1975, Position V1. (Reliability: 3).